Hometown: Born in Mason City, Iowa. Raised in Rudd, Iowa. Currently live in Huntington Beach, CA. Who do you play in "Tainted Dreams"? : I play Hunky Handyman Dylan Buckwald on Amazon's "Tainted Dreams." Tell us about "Tainted Dreams": "Tainted Dreams" is truly a masterpiece. It's written brilliantly and the actors and actresses are famous daytime legends. Put it all together and you have one of the best and most entertaining shows I've ever seen before. "Tainted Dreams" is basically a soap inside of a soap. It looks at all the drama behind-the-scenes of a fictional daytime soap opera called "Painted Dreams". Our all-star cast is made up of legendary veterans and current actors/actresses from top daytime shows such as "The Young & The Restless", "General Hospital," "All My Children," "Days Of Our Lives," "One Life To Live," "As The World Turns," "Guiding Light" and many more. "Tainted Dreams" was created and Executive Produced by 2-Time Emmy Winning Director/Producer Sonia Blangiardo and is based on her lifelong career in the genre. I actually worked with her twice before as well. 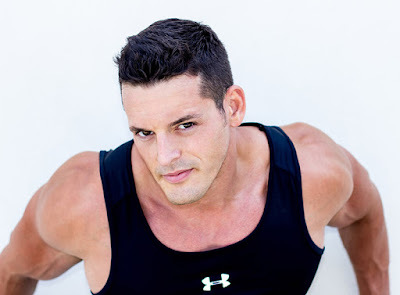 Sonia was the Executive Producer of my ESPN series, CAWL To Arms, and she also was Executive Producer of my Mr. PEC-Tacular Arm & Chest Workout DVD. Ironically, my buddy Austin Peck who was featured on my workout DVD, is also now a fellow Leading Man on "Tainted Dreams." What is it like being a part of "Tainted Dreams"? : It is AWESOME!! I had the time of my life. It's my first time doing a series of this nature and everyone could not have been nicer and more supportive. Working with some of THEE BEST actors and actors (not to mention the best Director!) in history was a tremendous honor. Everyone brought me up to their level and I was deeply appreciative. Everyone told me that they were very pleased with my performance and that made me so proud, I can't even tell you. You know, "Tainted Dreams" has become one of the biggest hits on AMAZON TV right now (on both Amazon and Amazon Prime). I'm very blessed. What kind of entertainment speaks to you? What or who inspires you as a performer? Any favorite theater productions? : My favorite kind of entertainment is watching TV. All kinds really. My favorite shows are, of course, Amazon's "Tainted Dreams", Pop's IMPACT on POP, CBS' "Big Brother," Pop's "Big Brother After Dark," CBS' "The TALK," CBS' "The Price Is Right," Pop's "Schitt's Creek," GSN's "Window Warriors,' and many other CBS and Pop TV shows. In acting, I get inspired by the legendary actors and actresses who I work with on "Tainted Dreams." In wrestling, it's the roster from IMPACT Wrestling. Nobody is more talented in the world in either genre! As for theater, I haven't had a chance to see too many shows but I'd love to see Hamilton and School of Rock next time I'm in New York. If you could work with anyone you’ve yet to work with, who would it be? : OH that one's EASY!!! Definitely TV LEGEND William Shatner. He's someone who I've looked up to for years and he's also become a friend. I have the utmost respect for him. He's been a tremendous supporter of mine and I'd be absolutely HONORED to work on any project with him. I'd also love to work on a series with my ridiculously talented buddy Josh Henderson (formerly of "Dallas" and "Desperate Housewives"), and soon premiering as the star of "The Arrangement" on E!). Finally, I'd also be thrilled to team up with my other buddy Jeff Timmons from 98 Degrees. He's a Media Mogul now and he's more successful and ever. I'd feel privileged to work with all 3 of them...on any project. What shows have you recommended to your friends? : I've highly recommended POP's "IMPACT" on POP, Amazon's "Tainted Dreams," CBS' "Big Brother," Pop's "Big Brother After Dark," CBS' "The Talk," CBS' "The Price Is Right," TMZ on TV, Pop's "Schitt's Creek' and GSN's "Window Warriors." They are THEE. BEST. SHOWS. ON. TV. Period. I may be adding a few more to that list shortly...but I can't talk about them just yet. What’s your biggest guilty pleasure? : My biggest guilty pleasure is working out. It's the one time I have to myself throughout the day. What’s up next? : You can catch me every THURSDAY NIGHT 8/7c on IMPACT on POP on POP TV in the US, at 8et on FIGHT NETWORK in Canada, and on the Total Access TNA App in The UK and Ireland. You can follow my journey as I try to realize my lifelong dream and become the IMPACT World Heavyweight Champion. We have new owners and they are truly THEE BEST IN THIS WORLD. Our new owners are ANTHEM SPORTS & ENTERTAINMENT and I couldn't be more excited and honored to be an important part of the ANTHEM family. Under ANTHEM's leadership, we're going to achieve heights we've never seen before...both nationally and internationally. I'm incredibly privileged to be working with Len Asper, Ed Nordholm, John "Big" Gaburick, Jeff Jarrett, Matt Conway, Dutch Mantell, Josh Mathews, Elijah Burke, Jeremy Borash, James Long, Madison Rayne, Bob Ryder, Al Snow, Ron Harris, Don Harris, Gregory Shane Helms, Pat Kenney, Rafael Morffi, Anthony Lucassio, McKenzie Mitchell, Amy Zack, Shane Emerson, and the entire IMPACT roster and production team. They mean the world to me and are my family. And it was also an honor to previously have worked for our former owner, Dixie Carter, as well. And, of course, you can see me on the full first season of "Tainted Dreams" on AMAZON right now. I am incredibly excited beyond belief to be a Leading Man on the series! Plus, you never know when I may pop up again on CBS' "Big Brother," POP's "Big Brother After Dark," or on CBS' "The TALK"!!! In fact, this year marks my 9th year as a VERY proud and privileged member of the CBS & CBS Big Brother families and I owe them the world. None of this would have been possible without them. In particular, Chris Roach, Robyn Kass, Rich Meehan, and Allison Grodner mean everything to me. They are my first family. And I am also working on 3 other TV surprises right now for 2017 but I'm sworn to secrecy so I can't divulge any details just yet...but I am TREMENDOUSLY excited about all 3 projects.